Bank of Korea’s Governor Lee Ju-yeol has just sounded caution on the economy, citing uncertainties about monetary policy normalisation by major central banks and trade tensions, as well as a weak labour market domestically. And he isn’t alone, the vice chairman of Korea’s National Economic Advisory Council, Kim Kwang-doo, has also warned of a potential slump. This follows North Korea withdrawing from the peace talks with the South this week, and probably with the US at the summit next month. While nobody is forecasting the Bank of Korea to change the policy at its meeting next week (24 May), the dovish remarks by top policymakers raise odds against further policy normalisation later in the year. We are reviewing our view of one 25bp BoK rate hike in the second half of the year. Judging from the 2.8% GDP growth, Korea’s economic performance hasn’t been any outstanding, despite sustained export strength this year albeit narrowly-based in the semiconductor sector. Besides, the contagious financial asset selloff elsewhere will carry some weight in the central bank policymaking. It’s not all about changing the policy interest rates though. A move to greater transparency about the exchange market intervention starting the second half of 2018 is a welcome development in stemming some currency volatility. April industrial production data in Singapore and Taiwan will inform on GDP growth of these economies coming into the second quarter of the year. Exports drive industrial production. But electronics exports, the mainstay of Taiwan and Singapore’s exports, have already started to weaken. Like Korea, the downside growth risk for other Asian economies is rising. We have recently revised our forecast for Taiwan GDP growth in 2018 to 2.6% from 3.2%. Thailand reports GDP data for 1Q18 on Monday (21 May). The authorities are still optimistic about growth accelerating further this year, though they may be disappointed by the GDP slowdown which we predict based on manufacturing slowdown in the last quarter. We forecast a 3.6% GDP growth in 1Q18, down from 4.0% 4Q17. In an environment of rising growth risk, inflation data will come under scrutiny for monetary accommodation. 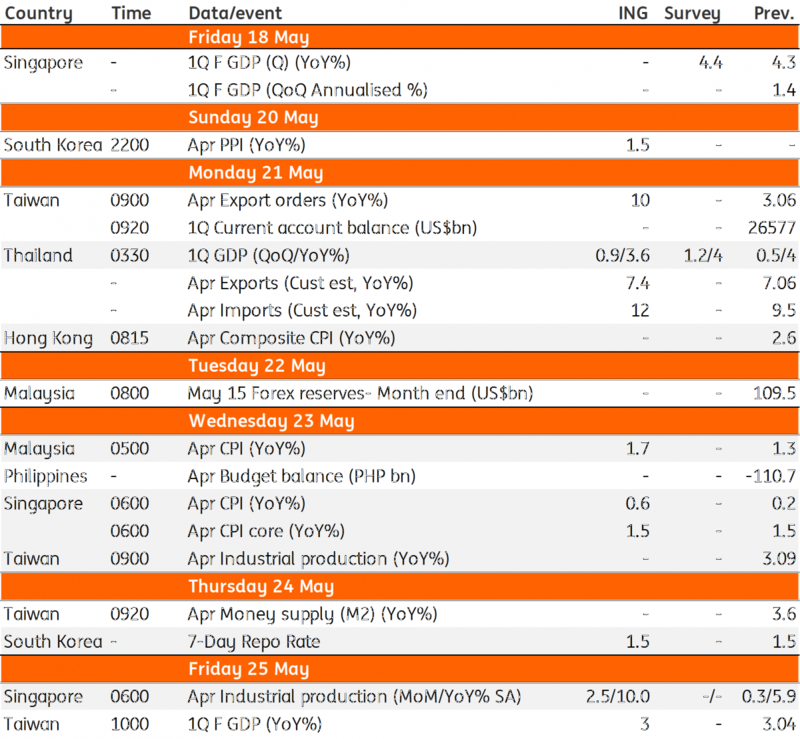 Hong Kong, Singapore, and Malaysia report consumer price data for April. China’s inflation dip in April points to the same for Hong Kong, thanks to transmission of lower food prices from the mainland. Inflation hasn’t been a policy worry in Singapore and with the central bank tightening in April, it’s unlikely to be one anytime soon. In Malaysia, the reduction of the Good and Services Tax to zero rate heralds a prolonged period of low inflation ahead. But we continue to anticipate Malaysia's central bank (BNM) normalising policy, with a further 25bp rate hike in 3Q18.